Call-backs Are Costing You More Than Just Money! Consider for a moment how much wet basement callbacks are costing your company. The homeowner calls – they are in panic mode, frantically, demanding that you have to respond to the problem quickly. Their possessions and stored items are getting wet, and every moment that passes is more money out of your pocket. Installing CactusBoard makes sense, and saves dollars and cents! But now you have to stop what you're doing – or get one of your people to stop what they're doing – and go to the home to determine what's wrong, and what to do next. Then YOU have to make and pay for the repair or pay an outside company to do it. This is beginning to sound expensive, right? 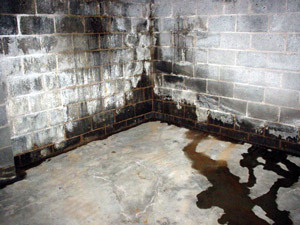 So you decide to save some of your hard-earned money and maybe you call in your Waterproofer or foundation company. Then they have to get there to see the problem…and then…of course, they blame the other guy or the excavator for bad grading…and the finger pointing goes on and on till someone agrees to fix the problem. And it doesn't end there – all of this wasted time and money is reducing your productivity and profits, not to mention your good reputation – something you work hard at keeping. Thankfully, there's a solution for this costly mess: CactusBoard Dry Floor Edging. Cracks, window wells, pipe penetrations, and form ties will capture leaks from the footing/wall joint and direct them safely under the floor where the water can be drained by a sump pump or functioning daylight drain. CactusBoard is designed to keep any unplanned leaks from reaching the basement floor by creating a space between the floor and wall and floor and footing. It allows water from cracks, window wells, pipe penetrations and form ties to pass down the wall, across the footing and into the stone below the slab. NOT ON THE BASEMENT FLOOR. EVER. From the stone, it can then drain to a sump or daylight gravity drain – and out of the house. We're so sure that CactusBoard will work that we include a 20–year Dry Floor Warranty which you can present to the homebuyer. This iron-clad warranty is one of the things that sets this foundation waterproofing product apart from any other. No one else has a dry floor warranty or local representation to handle a warranty issue if there ever is one. So for less than $200 per home, it makes sense to get started as soon as possible. Try CactusBoard on one house. See how easy it is to install, and how effective it will be. If you like it, just pick up the phone to reorder. If you don't like it…at least you'll have one basement that will be protected from the potential of a wet basement and the nightmare that goes with it.